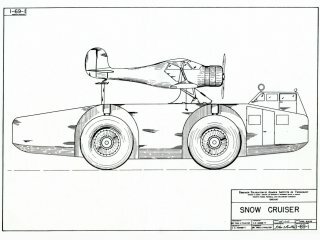 The original conception of the Snow Cruiser is most often credited to Dr. Thomas C. Poulter. Dr. Poulter served as second in command of Admiral Byrd's Antarctic Expedition II. 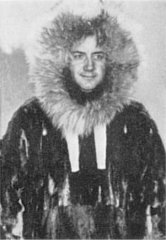 During this expedition, Admiral Byrd nearly lost his life when he was isolated by the weather at the Advanced Base. 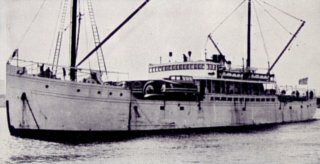 It took three attempts for Dr. Poulter to rescue the Admiral due to the difficulty of traveling a mere 123 miles in the inhospitable conditions. This incident is believed to have been the spark that inspired Dr. Poulter to first visualize the Snow Cruiser. After returning from Antarctica Dr. Poulter took the position of scientific director of the Research Foundation of the Armour Institute of Technology in Chicago, Illinois. 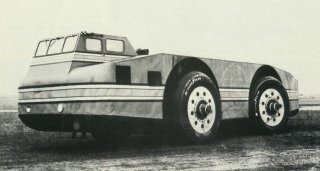 Dr. Poulter is said to have presented the idea for the Snow Cruiser to Harold Vagtborg, the Director Research Foundation and the rest of the staff of the Foundation. The Foundation elected to undertake design of the Snow Cruiser, and assigned it Project Number I-69. Under the direction of Dr. Poulter, the staff of the Research Foundation worked for approximately two years (1937 to 1939) on the design. In the spring of 1939 the Research Foundation learned that the government was considering appropriations for a possible Antarctic expedition. Mr. Vagtborg and Dr. Poulter presented the completed plans for the Snow Cruiser to the expedition officials in Washington on April 29, 1939. The officials were enthusiastic over the idea and it was agreed the Foundation would supervise the construction and finance the cost, estimated at $150,000. 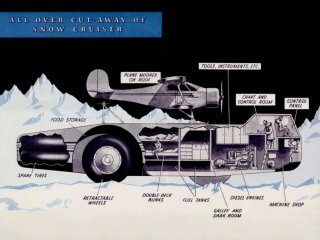 The Snow Cruiser would then be loaned to the U.S. Antarctic Service, who would defray the costs of operation and maintenance, and then return the Cruiser to the Foundation upon return of the expedition. 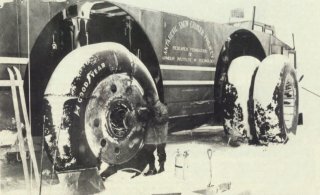 Work on the Snow Cruiser was begun on August 8, 1939 at the Pullman shops in Chicago Illinois. 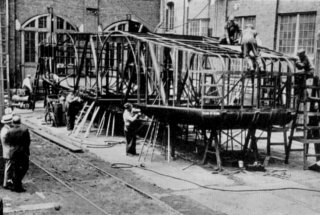 The Foundation had just eleven weeks to build, test and deliver the completed Snow Cruiser to Boston, Massachusetts where it would be loaded aboard ship for transport to Antarctica. On October 24, 1939 the nearly completed Snow Cruise began a 1021 mile trek to Boston. This trip would be the shakedown cruise as well as a race the reach Boston before the North Star sailed for the Antarctic. If the Cruiser did not arrive in time, she might be left behind. On November 12, the Snow Cruiser pulled alongside the North Star at Boston Army Wharf. To fit on the deck of the North Star, the Cruiser's tail section had to be temporarily removed. At high tide Dr. Poulter drove the Cruiser onto the North Star. The North Star put out to sea on November 15, with the Snow Cruiser safely lashed to her deck. As she neared Antarctica, rough seas caused the Cruiser to shift during the night giving Dr. Poulter and the Snow Cruiser crew a bit of a scare. They tightened up the chains and the Cruiser was secure for the remainder of the trip. The North Star arrived in Antarctica on January 11 and began the search for a suitable place to unload the Cruiser. On January 12 the North Star anchored at the Bay of Whales. To unload the Snow Cruiser from the deck of the North Star, a large ramp was constructed of heavy timber. 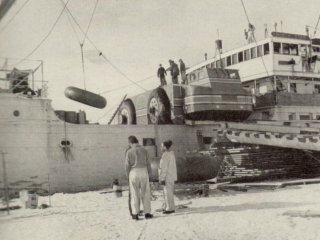 Unloading of the Snow Cruiser took place on January 15, with Dr. Poulter at the helm. Half way down the ramp the timbers began to break. Dr. Poulter quickly gave the Cruiser full throttle and she lurched from the ramp to the safety of the ice. The Snow Cruiser failed to perform up to expectations. The tires sank deeply into the snow and spun too easily. In an attempt to improve the cruiser�s performance, the crew attached the two spare wheels and tires to the front front wheels, increasing the surface area of the tires by 50 percent. To improve traction, they installed chains on the smooth rear tires.